Each attendee will receive a certificate of training from Auxo Medical LLC at the end of the course. This certificate has been widely recognized by Healthcare companies and large equipment service companies across the country as evidence of high-quality training. 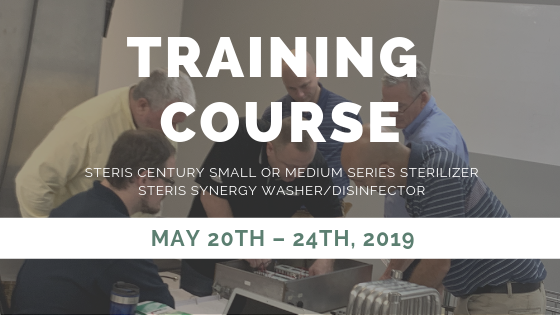 Locate the preventive maintenance schedule and learn how to use it to perform OEM recommended preventive maintenance on the Steris Century Small or Medium steam sterilizers. of the Steris Operator, Maintenance, Service, and Parts manuals. Access and locate all necessary parts, maintenance, and troubleshooting information in each of the Steris Operator, Maintenance, Service, and Parts manuals. Each Student will receive a hard copy or electronic copy of each of the manuals above as well as the Auxo assembled Training manual complete with detailed information and photos. To Enroll, send a Purchase Order to Auxo Medical LLC with the names and phone numbers of each candidate that will participate. Payment for each candidate will be required by May 13th, 2019 for each candidate. Interested in a training class? Fill out the form below or contact us to register!